The idyllic town of Wimberley, about 15 miles northwest of San Marcos, lies nestled under ancient bald cypresses, pecans and oaks where Cypress Creek meets the Blanco River. The town had a trading site as early as 1848, and today its center is officially designated as a Texas Cultural District, brimming with art galleries, shops and restaurants. But on the first Saturday of each month from March through December, the big attraction is Wimberley Market Day at Lions Club Field, a six-acre site on Ranch Road 2325 where about 475 dealers sell antiques and collectibles, crafts, imports, clothes and accessories, tools, plants, and locally made foodstuffs. Adding to the festive atmosphere, live music usually emanates from the pavilion. 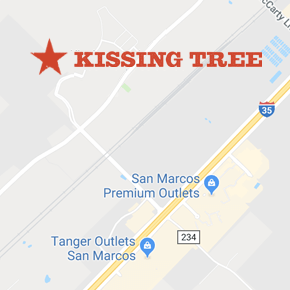 Enjoy trips to market days with your Kissing Tree neighbors! Our Lifestyle Director, Kevin Wilson, has Hill Country adventures planned each month, including trips to Wimberley Market days. See the full list of lifestyle events here. Operating since 1964, when shoppers could buy live pigs from the backs of vendors’ pick-up trucks, Wimberley Market has grown into one of Texas’ largest flea market events. Volunteer-run by members of the Wimberley Lions Club, it’s about more than shopping for the sake of shopping. Proceeds from booth rentals, food and drink sales (including ice cream, burgers, wine and beer! ), cart rentals and parking fees raise about $500,000 a year for scholarships, community projects and local charities. The market operates from 7 a.m.-4 p.m. on the first Saturday of each month, March through December. Admission to the market is free, but parking is not. To support the Lions, park in one of their three big lots. The concession stands don’t accept credit cards, so carry some cash. Use the “U Call-We Haul” service – a $10 minimum – to get large purchases to your car on a motorized cart driven by a Lions Club volunteer.